We’ve found the best rooftop bars in NYC. 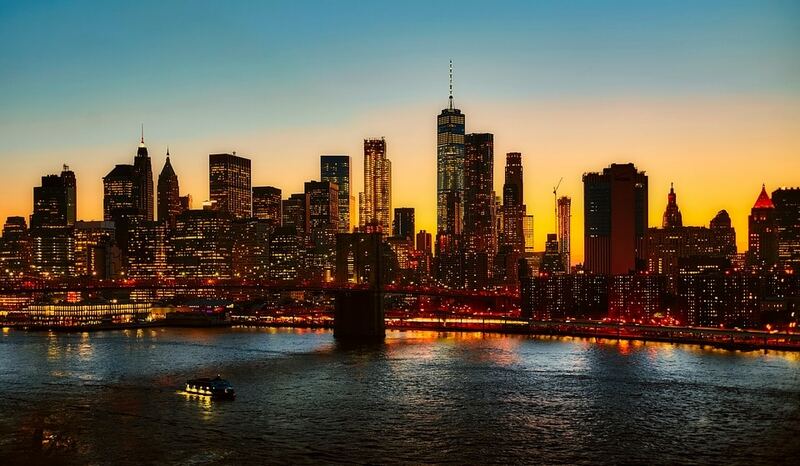 Whether you’re looking for casual beer gardens and corn hole or swanky bottle service and a VIP scene, the Big Apple has it all. In the city that never sleeps, the NYC bar scene is second to none. Entrepreneurs and aficionados have certainly capitalized on its stunning skyline, scoping out the top places to open bars and restaurants. As a result, you can find plenty of places to grab a drink - all with incredible views. As warm weather rolls in for spring, art shows pop up, and locals ditch their thick winter layers. First-time visitors should know the city has a magnetic charm. Once you go, you will just keep coming back, pleasantly surprised with new finds each time you do. But for now, it’s time to get exploring. Here are the best rooftop bars in NYC. Pop a bottle. Let it fizz. Take a sip. Come enjoy the Rainbow Room’s comfortable lounge and stunning outdoor terrace. You’ll take the elevator in 30 Rock all the way up to the 65th floor. Sprawling before you are all the lights, bustle, and glamor of Manhattan. You’re paying for a classic bespoke experience and arguably, the best views you’ll find in the city. Order an Ironweed Straight Malt Whiskey or Lavender Bitters. While the cocktails are certainly not signature and by the book, Bar SixtyFive has managed to produce true new classics. Sometimes the most beautiful escapes sit in plain sight. 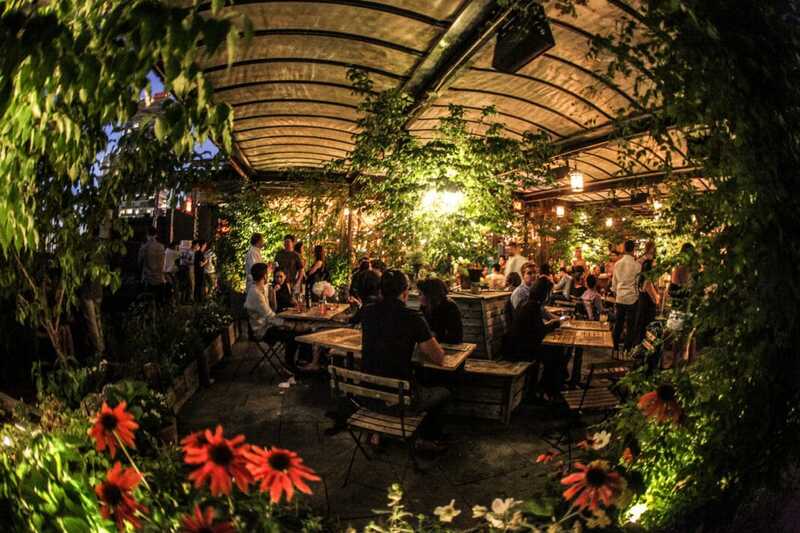 Atop the roof of the McKittrick Hotel sits the lush paradise of the Gallow Green restaurant and bar. If you have ever heard of the hotel’s famous interactive theater piece, Sleep No More, it certainly carries over to this venue. While the atmosphere is charming, the history is a little bit more mysterious. The bar was named for a Scottish field where accused witches were once hung. Putting aside the spooks, McKittrick has managed to turn the name around. Among locals, Gallow Green is known best for its friendly service, cozy ambiance courtesy of string fairy lights and tattered flags, and their signature cocktails. We’ll have take some of that blackberry pine liqueur on the rocks. 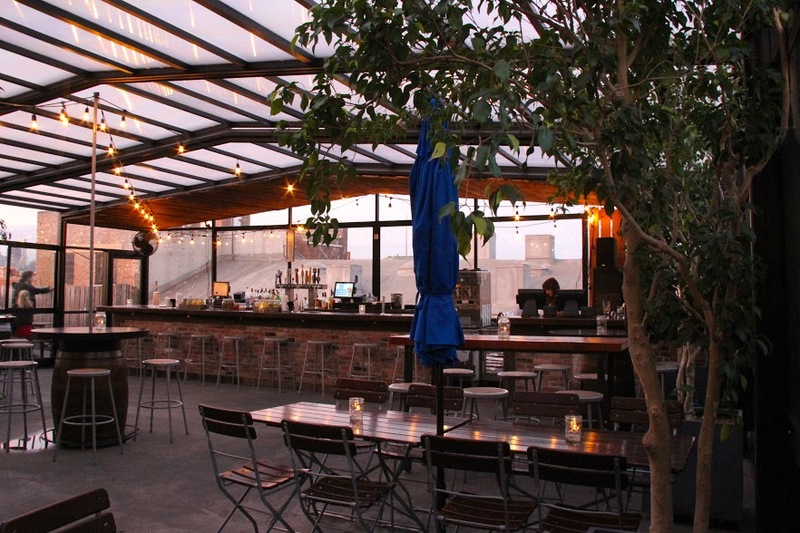 It’s easy enough to see why it’s earned a place as one of the best rooftop bars in NYC. Step out of the elevator and into a charming Art Deco-inspired rooftop bar setting in the Ides at Wythe Hotel. The rumors are true, too. Manhattan views are even better from Brooklyn. If it’s a chilly day, you can still enjoy stunning views from the floor-to-ceiling windows. But for us, we’d prefer the outdoor terrace. The dramatic skyline is enough to draw us out, even if the locals don’t seem impressed by it. The cocktails coming our way are enough to keep us here. Here, bartenders serve up smart classics and trendy mixes of them. One of our favorites is the Sixth Floor Sling, a gin and lemon tonic served up with nodes of allspice, apricot, and lemon sherbert. If you’re more of a wine connoisseur, not to worry. Just ask your server and they will present you with a unique list of flavors to choose from. You'll soon add this to your list of the best rooftop bars in NYC. Now, the Top of the Strand is the place to be. Famous for being one of the best rooftop bars in NYC, the Strand Hotel’s 21st floor is reserved for their drinkery. It is another one of the best bars in NYC to be sure. 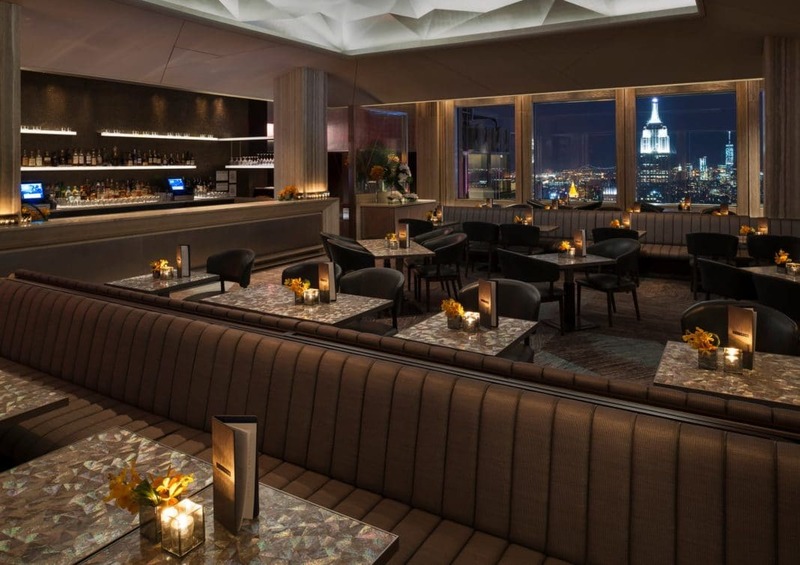 Boasting uninterrupted views of the Empire State Building, this little spot has become so popular that they do not take reservations for regular tables. It’s a first come, first served kind of deal, so keep your high heels in your purse and hurry there. You can change later. So what is the price of admission for this show? Signature cocktails run around the standard of $15, while craft beers will run around $9 a bottle. If you have money to spare, go big and rent your your own cabana. You won’t have to worry about the weather, since the bar’s retractable glass roof will keep you safe from all the elements. Ten out of ten would recommend. Dress your best and prepare to sip the fanciest cocktails in Times Square. St. Cloud is definitely one of the sexier venues downtown. If the space alone doesn’t offer a “wow” first impression, we guarantee the views of Times Square will. Modern twists on old classics pervade the menu. You won’t find anything too plain or signature here. Make sure you know what you want. While an applejack rose might sound tempting, its $24 price tag might be a little hard to swallow. 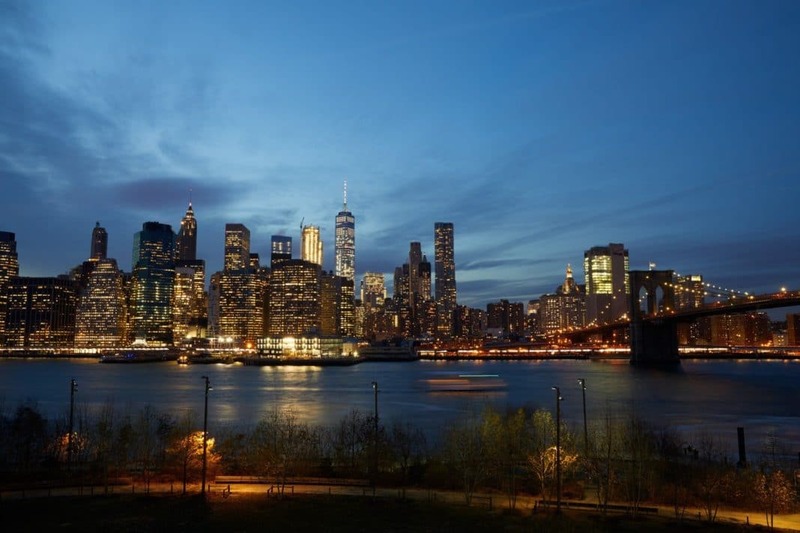 From across the East River, gaze out at the flickering lights of the Manhattan skyline from Berry Park. After a recent renovation, this 3,000 square foot deck offers plenty of space for tourists looking to grab a drink and wind down after a long day pounding the pavement. One of our favorite features is the retractable glass roof. 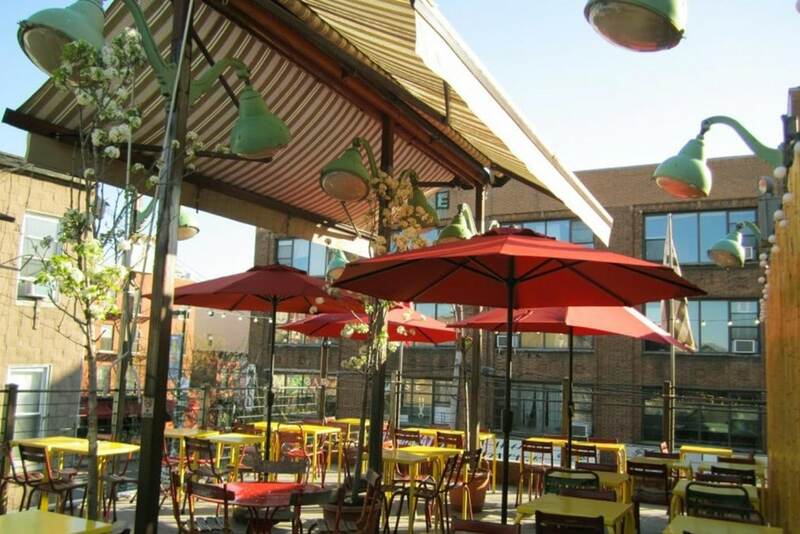 Whether rain or shine, you can enjoy yourself on the outside patio. Enjoy European brews and equally tasty German food - bratwurst, sauerkraut, and fries. Come summer, different DJs play sets, turning the mellow atmosphere into flavorful Boozy Beats Sundays. Welcome to the Magic Hour. 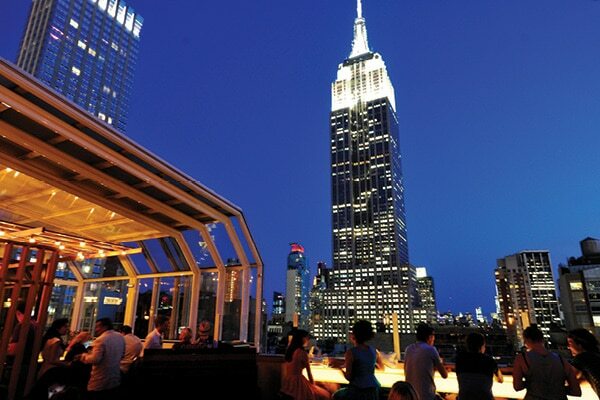 While we promised you the best rooftop bars in NYC, it is so much more than that. If you’re in the mood for a little fun and games, sip your drinks in this carnivalesque setting filled. Challenge your partner to a friendly (or competitive) game of mini golf, have some fun on the rotating carousel seating, explore the greenery in a topiary garden. For drinks, the mixologists seem to cover all the bases. Treat yourself to a house favorite, the “Allspice No Drama,” with vodka, strawberry shrub, and allspice. Another great drink is the “Float My Boat,” a savory and spicy treat complete with caramelized pineapple, tequila, and jalapeno. If you want something more casual but you’re tired of Williamsburg’s dive bars, head on over to Juliette. This French bistro offers great drinks in a charming little outdoor setting. 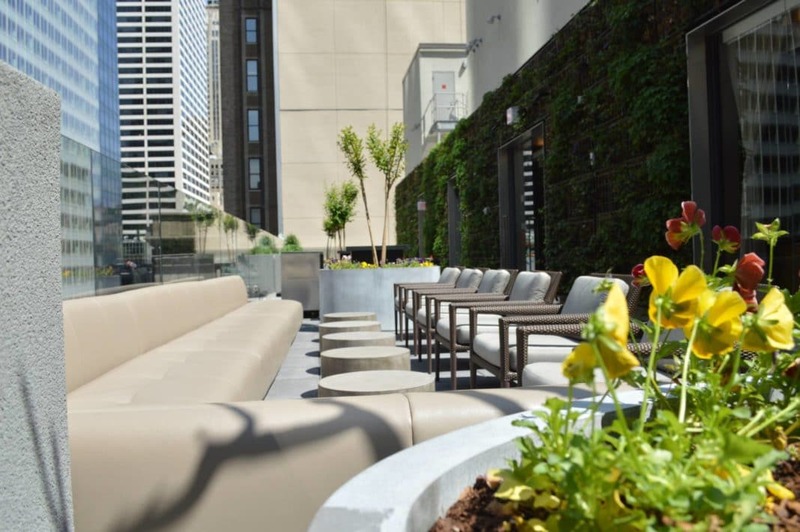 If you’re looking to party, the rooftop deck might be more your style. Brunch is served throughout the week with a special terrace menu on Saturday and Sundays. Mimosas, anyone? You could ask any local where the most iconic views of Manhattan are in existence. They would tell you Brooklyn Bridge Park and Promenade. 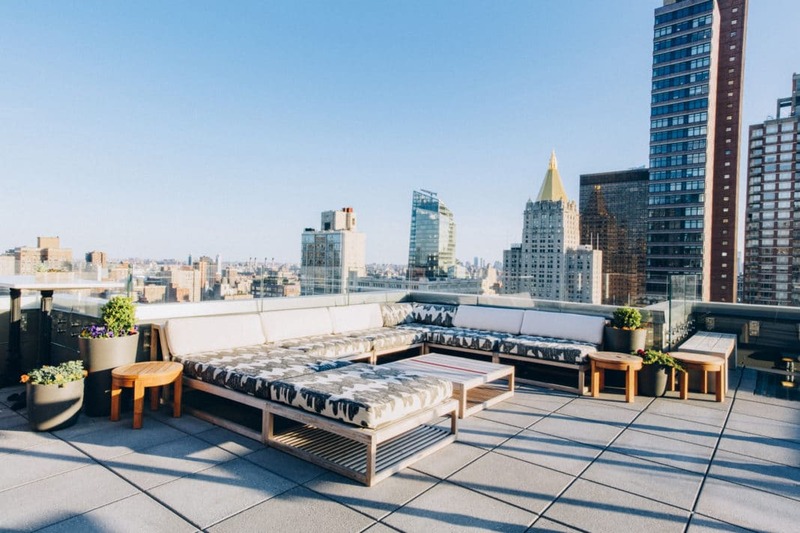 1 Rooftop offers unparalleled views of them both. If you’re looking for a casual night out with friends and aren’t in the mood to smuggle around a bottle of rosé, then we recommend booking a chill night here. The views are better from the top, anyways. So soak in all the sights of chic, industrial Brooklyn and let the night go where it wants to. Recently reopened as SERRA by Birreria, this spacious rooftop bar and cheerful ambiance lends to the store’s many attractions. Lovers of Italian cuisine, this one's for you. "SERRA," meaning "greenhouse" in Italian, celebrates the culture and cuisine of Italy. It serves up the widest selection of biodynamic wine in NYC along with herb-infused botanical cocktails, and regional dishes from Tuscany, Liguria, Campania, and more. 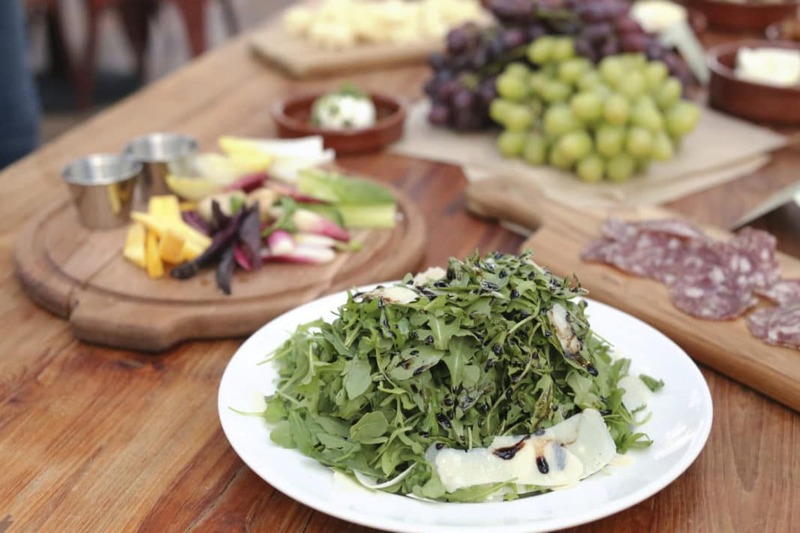 All the dishes are made with ingredients sourced from their favorite U.S. farmers and Italian producers. For this one, we’re taking you to trendy Williamsburg, one of the best rooftop bars in NYC. Ascend 22 stories to the top of the flashy William Vale. Here, Westlight offers some of the best panoramic skyline views in the city. 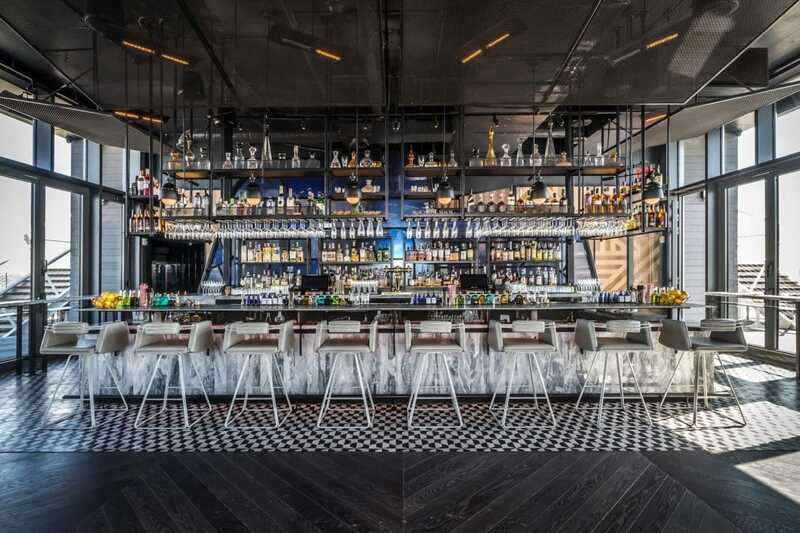 Enjoy sleek modern architecture, funky patterns, and delicious signature drinks and pairings. While you’re here, you have to try a few appetizers. We highly recommend the duck carnitas tacos and the dry-aged burger, courtesy of their in-house chef, Andrew Carmellini. The bar program is lead by General Manager, Maura McGuigan, who presents a diverse menu of original and classic cocktails, rare spirits, craft beer, and wine. It really looks like Westlight has it all. It’s called the Heights for a reason. All the way up at the Arlo Hotel sits one of the best rooftop bars in NYC. 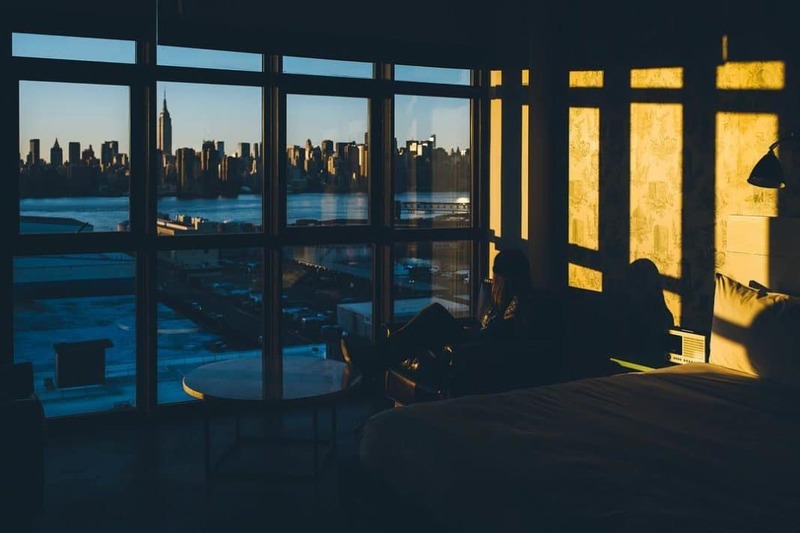 With expansive views of the skyline and Empire State Building, the Heights offers guests an ideal place to have some drinks, hang out with friends, and grab a slice of mouth-watering pizza. Savor the tastes and take it all in. 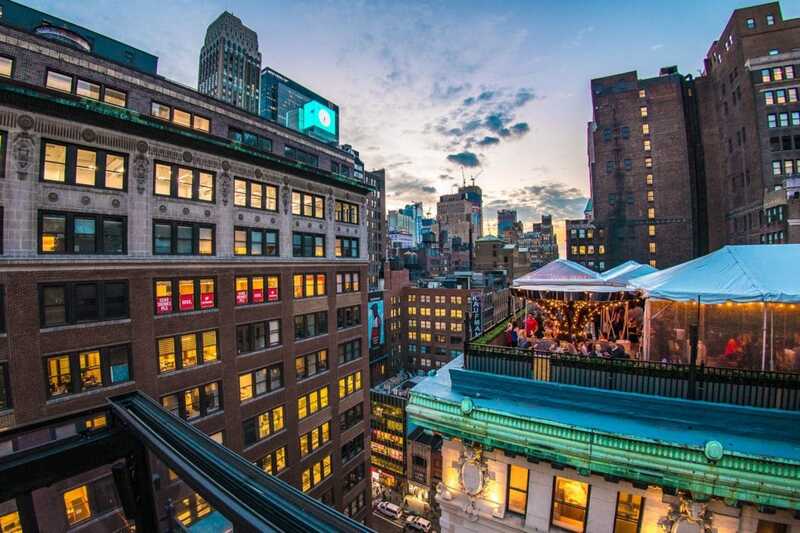 Where Should You Go For the Best Rooftop Bars In NYC? If we could say all of them, we would. Why not try? Rooftop bar hopping is something like a sport in this city. This means that every nice upper level bar is going to be packed. But if you’re in the Big Apple, you might as well see the best. So brave the crowds and pick out your favorite spots. Whether you are looking for something sleek and refined or more low-key and intimate, our list has covered it all. Take your pick from one of our top choices above. We guarantee you’ll love your time in this amazing city. There are so many unique places to stay and things to do.